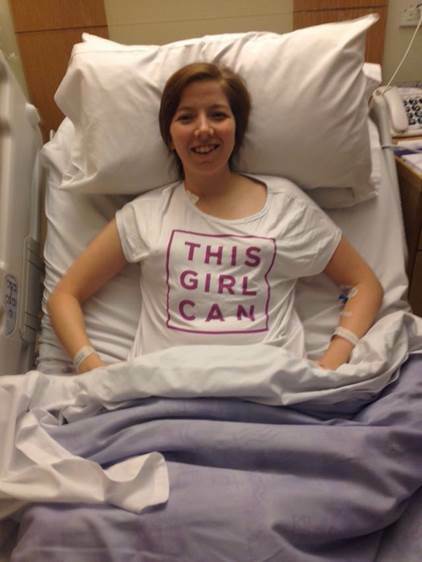 As a fit, healthy, vibrant thirty-year-old, I never expected to be told I had stage three bowel cancer. Sitting in that harshly lit consulting room, receiving the news in December 2015, life changed, irreparably. All my plans and dreams went on hold in that instant; the mountains I would climb, the adventures I was planning, the races I would run. Now, a whole different set of challenges presented themselves; surgery, hormone treatment and chemotherapy. My cancer was about as bad as it could be without being really bad – if you know what I mean. Stage three means it’s spread about as far as it can before being classed a metastatic (where other organs have been infected with cancerous tumours crushing the odds of survival). Ultimately, it was caught just in time. And it’s thanks to the tireless work of charities such as Bowel Cancer UK, that GPs, like mine who had referred me at the first time of asking for a set of belt and braces tests, are made aware of the possibility that the under 50s can, and do, get bowel cancer and shouldn’t be palmed off with a diagnosis of stress related IBS. Each year in the UK, 2,500 young people under the age of 50 are diagnosed with bowel cancer and the number is rising. Bowel Cancer UK’s work to raise awareness around the issues for young cancer patients is critical to arresting this trend. My treatment involved keyhole surgery to remove the tumour and along with it came a decent chunk of my large bowel and 36 lymph nodes. I was out of hospital three days later – home in time for Christmas. Up next was fertility preservation treatment before the ravages of a six-month course of chemotherapy. Bowel Cancer UK’s focus on funding research is critical for improving patient outcomes. Their essential work that focusses on developing surgical treatments as well improvements in chemotherapy and genetic testing is vital and your donation to my JustGiving page will go directly to this lifesaving research. Throughout my treatment and recovery, running has been an essential therapy and escape mechanism. 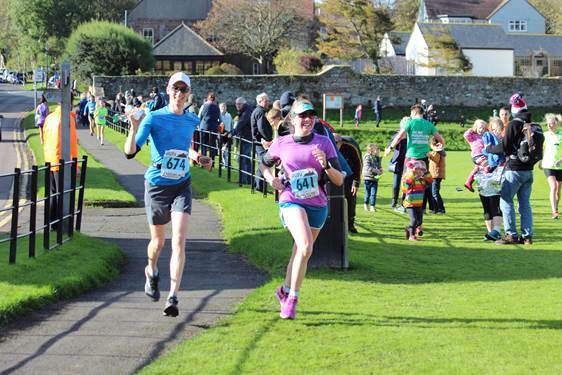 At the time, I was overcome with a strange feeling that my body had let me down despite all the care I took with my diet and the amount of exercise I did prior to my diagnosis. Running became proof that I still had some ownership over my body and what I could push it to achieve great things. Pulling on my trainers and heading out doors also served as a welcome escape from the enforced routine of appointments, blood tests and the necessary rest following the poisonous chemo doses. Since finishing my clinical treatment, running has been a treatment in itself. The space a long run gives me to think is a welcome salve for an overwrought and worrisome mind. I can’t thank Bowel Cancer UK enough for the chance to “run London”. It has been a dream of mine for a long time. Every year the ballot entry would come back with the ‘Sorry, you were not successful this time’ and I would be able to think ‘Oh well, plenty more opportunities to apply’. Two years ago, those opportunities appeared to disappear in an instant with the heart-breaking words of the doctor ‘It’s cancer’. 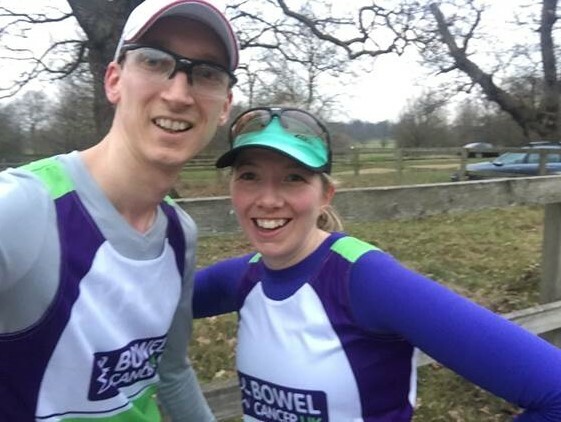 Thanks to Bowel Cancer UK’s tireless efforts to improve patient survival rates and raise awareness of the UK’s second biggest cancer killer, I will get to run that famous route around my home town next April and raise some much-needed money for a great charity in the process.